The blind men and the elephant (wall relief in Northeast Thailand). Once a king invited six blind men to examine an elephant. 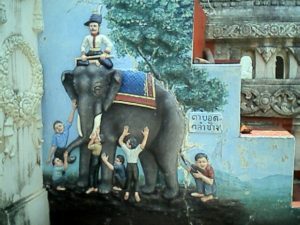 The first felt his trunk and said, “An elephant is like a tree branch.” The second felt his leg and concluded, “An elephant is like a palm tree,” while the third felt the elephant’s belly and said, “Elephants must be like walls.” The fourth felt its tail and said, “You’re all wrong. Elephants are like ropes,” while the fifth concluded elephants were like pipes because he had felt its tusk. The last blind man, feeling only the elephant’s ear said they were all wrong. “Elephants are like giant fans!” The king was greatly amused by it all. Many people use this story to describe religion and spirituality. God is like the elephant and all religions, like the blind men, have some truth, so it really doesn’t matter what you believe. Everyone is correct. Do all paths lead to God? Most people have smoke detectors in their homes and believe they will wake us up in case of a fire, but when was the last time the batteries were tested? That’s a dangerous assumption. There are at least two major problems with the assumption, all paths lead to God. First, the person making that assumption takes the place of the king. “I’m not blind. I can see the whole elephant!” Worse, he won’t be able to test his assumption until it’s too late. I loved my grand, old sailboat and when I set sail on a long-distance voyage, I choose a compass course and blindly believe I will arrive at a distant port if I stay on that heading. However, I won’t really know if my choice is correct until I arrive. The port will be there or it won’t. That can make for some sleepless nights! I would feel much better if there was a way of testing my assumption along the way. I could rest easy if I passed an island or met a ship coming back from the port I was aiming for. Is there anything in the world of religion like that? Unfortunately, religious teachers are like blind men describing an elephant. They share their conclusions and we are expected to blindly believe them. Christianity is completely different. The other teachers taught and died. Jesus died and taught and therein lies the difference. Jesus is the king who saw the whole elephant.